While the developing world is in serious need of fresh drinking water, millions of consumers in western countries continue to buy bottled water, even when perfectly safe tap water is available to us in our own homes. By buying bottled water, we are personally contributing to plastic pollution and worldwide droughts, not to mention the success of nasty corporations like Nestle. Nestle is one of the largest multinationals in the world and serves as an umbrella corporation for thousands of household names. In addition to chocolate, cereal, baby food, sauces, yogurts, frozen food, ice creams, pet food, and much more, Nestle also holds something of a monopoly on bottled water. Nestle water is sold under a wide array of different brands, including Deer Park, Arrowhead, Poland Spring, Ozarka and Ice Mountain. 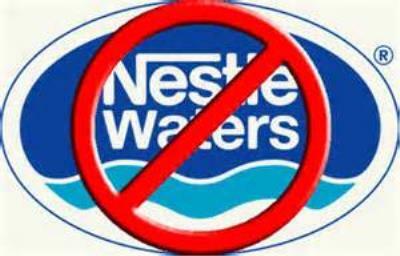 Of all Nestle’s interests, water is the corporation’s most profitable commodity. They will go to any lengths to find it, bottle it, and sell it back to you at inflated prices. Nestle has been caught taking groundwater from drought-stricken California, a state which currently has the worst water shortages for over 1200 years. Is this a coincidence, or could Nestle’s shameless and ecocidal policies be a huge contributing factor to the crisis we are now seeing? 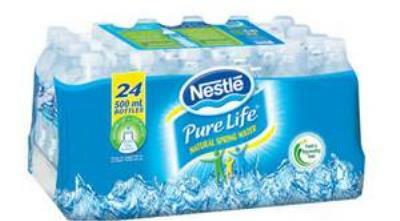 In Ontario, Canada, citizens have claimed that Nestle pays just $3.41 for every million liters of water it extracts from the ground, which is an insanely low price for the most precious resource we have. This water is then bottled and sold back to consumers who have been brainwashed into thinking it’s a necessary part of their health regime, making Nestle a $2 million profit (while laughing at you all the way to the bank). Many of you will already know that Nestle’s CEO Peter Brabeck has claimed various times, unashamedly and on camera, that water is not a human right; it should be privatized. The current global economic system allows this insane idea to flourish with little resistance- and yet with so many of us feeling repulsed by Brabeck’s inhumane attitude, the question needs to be asked: why on earth are millions of consumers still buying bottled water? To produce just one liter of Deer Park, for example, a staggering 86 liters of oil and 3 liters of water is needed. Let that statistic sink in for a moment, and you might just find your taste for bottled water diminishes a little. Here are a few more shocking facts to consider: The price of bottled water is 10,000 times more than tap water. 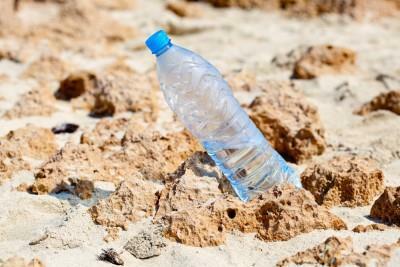 Americans consume 8.6 billion gallons of bottled water per year. Globally, 53 billion gallons are consumed, generating enormous profits for companies like Nestle of over $60bn worldwide. The annual production of bottled water uses 17 million barrels of oil, which is enough to fuel one million cars for a whole year. Finally, only one in five plastic bottles is recycled so just think about where the rest of them end up: clogging our landfills and polluting our oceans. The groundwater extracted by corporations like Nestle belongs to us, the people of the world. It was given to us by nature, to safeguard and use freely, taking only what we need. The world provides enough water for all of us. But every time you buy bottled water, you are allowing multinationals to steal our most precious resource, which has a devastating effect on the world’s poorest people. You are also giving corporations the green light to burn more fossil fuels and you are blindly contributing to water shortages in parts of the world where buying clean bottled water simply isn’t an option. The sad fact of the matter is, the Mad-Max style water wars currently being waged against the global population by corporations like Nestle will continue for as long as we are dumb enough to buy bottled water. If you really want to help fight this situation, boycott this unnecessary commodity now. The above video from YouTube current affairs show The Young Turks goes into more detail about Nestle’s corrupt water-stealing practices in California earlier this year.